230 Clarendon (109 Newbury) is located on the NW corner of Clarendon and Newbury, with 232 Clarendon to the north, 220 Clarendon to the south, across Newbury, 233 Clarendon to the east, across Clarendon, and 111 Newbury to the west. 230 Clarendon (109 Newbury) was built ca. 1871, designed by architect Charles Amos Cummings (of the firm of Cummings and Sears) as his home. Charles Cummings purchased the land for 230 Commonwealth on January 15, 1872, from Isaac Sweetser, who had purchased it from Newton Talbot on May 16, 1871. 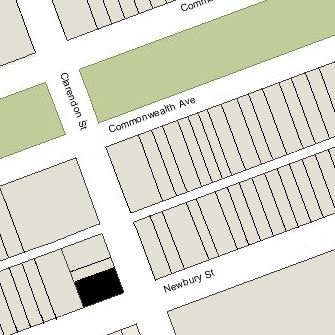 The lot – with 48 foot frontage on Clarendon — was the southern portion of a parcel which Newton Talbot had purchased on the same day from the Commonwealth of Massachusetts. 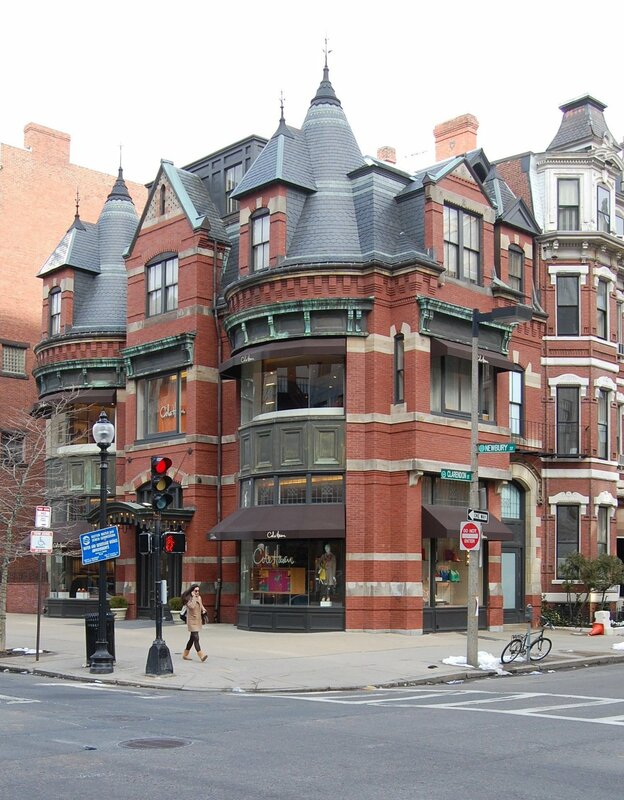 He sold the lot to the north, with a 19 foot frontage, on January 1, 1872, to Uriah H. Coffin, a building contractor, who built 232 Clarendon on it. Newton Talbot retained the northern portion of the original parcel, with a 45 foot frontage, and had 234-236 Clarendon built on it. He and his wife, Calista (Clement) Talbot, made 236 Clarendon their home. Click here for an index to the deeds for 230 Clarendon. Charles Cummings and his wife, Margaret (Kimball) Cummings, lived at 230 Clarendon for the rest of their lives. They previously had lived at 9 Union Park. 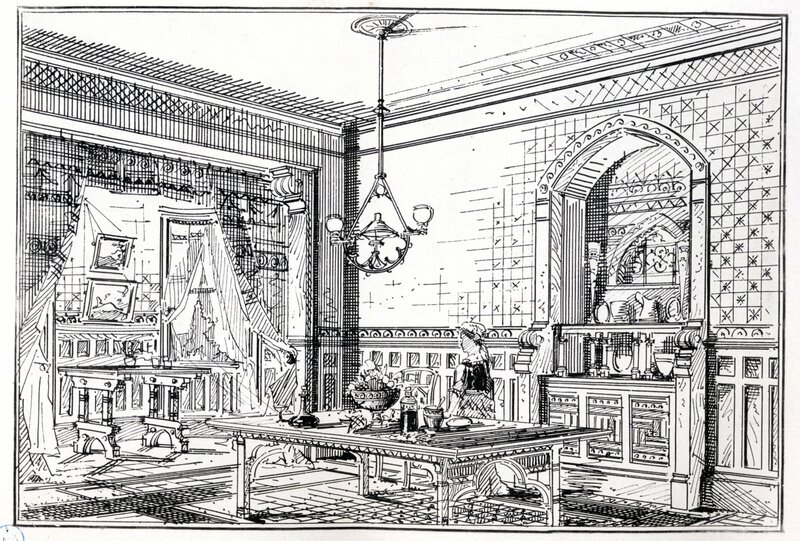 The dining room was illustrated in The Book of American Interiors, by Charles Wyllys Elliott, published in 1876. Charles Cummings died in August of 1905. Margaret Cummings continued to live at 230 Clarendon until her death in July of 1922. Their daughter, Margaret C. Cummings, lived with her. Miss Cummings continued to live at 270 Clarendon during the 1922-1923 winter season, but moved thereafter. In May of 1923, she purchased 300 Beacon. She did not move there until about 1925 and may have been traveling abroad. 230 Clarendon was not listed in the Blue Books after 1923. 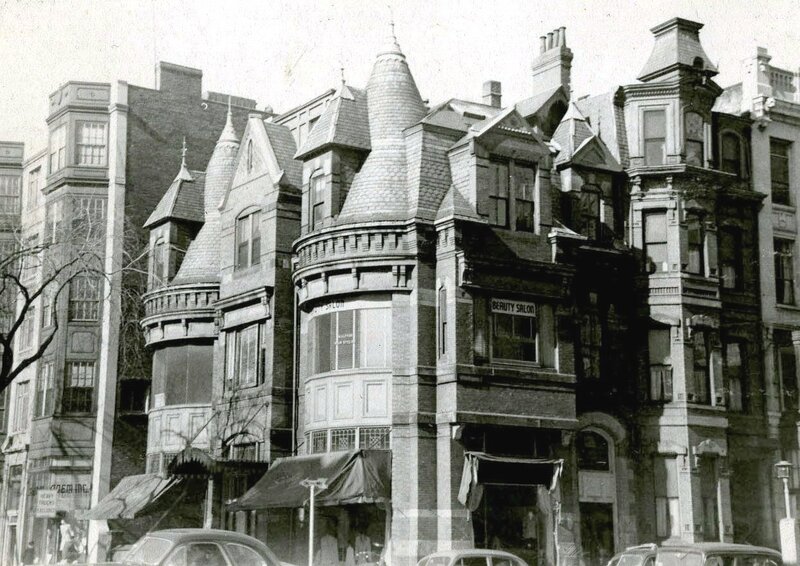 On June 4, 1923, 230 Clarendon was purchased from Charles Cummings’s estate and children, Charles Kimball Cummings and Margaret Cummings, by real estate dealer William H. Agry as trustee of a real estate investment trust he formed in 1912 with Edward N. Chase and Ralph E. Johnson. On December 31, 1923, 230 Clarendon was acquired from William Agry by Mary Bryant (Pratt) Brandegee, the wife of real estate dealer Edward Deshon Brandegee. They lived in Brookline. By 1925, 230 Clarendon had become a retail store and office building. On June 24, 1935, Mary Brandegee transferred 230 Clarendon to a trust for the benefit of her children. In June of 1943, the Brandegee trust acquired 232 Clarendon. The trust continued to own both buildings until the mid-1960s. In July of 1973, the Lee Realty Trust sold 232 Clarendon to William Lewis Hodgins. The Trust retained ownership of 230 Clarendon. 230 Clarendon remained a retail store and office building in 2016.